As vehicles become more automated, there are more features that require immediate attention if they stop working. In many of these cases, a ‘Check Engine’ light or notification will be illuminated on your dashboard display. Read on for more in our crash course on the ‘Check Engine’ light. Your vehicle’s engine needs electricity run. From the battery to the spark plugs, from the distributor to all of the wiring– the whole system powers a wide array of devices necessary to run a modern vehicle. Faulty electrical can lead to unpredictable breakdowns and major repairs, so it is a common culprit of the ‘Check Engine’ notification. The internal combustion engines that run our vehicles require a delicate balance of fuel and air. Thanks to contemporary inventions, hyper-accurate sensors can automatically measure and adjust to changes in the air-fuel mixture. Unfortunately, these parts can experience glitches or degrade over time– which can lead to more expensive repairs if left unaddressed. It may seem like a modern inconvenience, but it’s best to be thankful for your ‘Check Engine’ light. The exhaust system of most vehicles have undergone much innovation and technological advancement. One such improvement is the catalytic converter, which is unfortunately prone to failure over long-term or heavy duty usage. The resulting spike in emissions and harmful materials means your ‘Check Engine’ goes on when your exhaust system malfunctions. Believe it or not, something as small and inert as the cap of your fuel tank can cause that dreaded ‘Check Engine’ light to illuminate. A loose, faulty or unscrewed gas cap means your vehicle is evaporating fuel directly from the tank. The reduced fuel economy, increased emissions and potential risks all make this simple issue vital to the safe operation of your vehicle. As always, be careful and deliberate when refueling any vehicle. Hoses of rubber or other material are a crucial aspect of the airflow and heat distribution of your vehicle’s engine. Due to repeated cooling and heating, these parts inevitably break down and develop cracks or leaks. 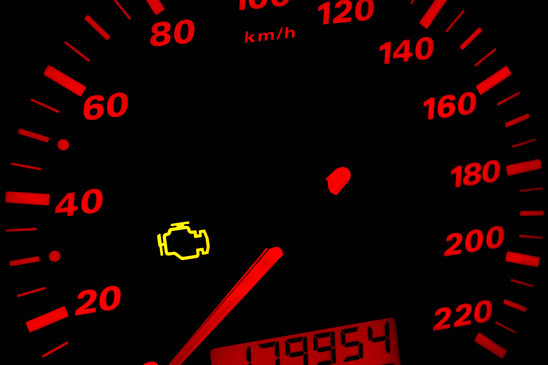 Any fault is important enough that the ‘Check Engine’ light usually comes on. As we all lead busy lives, it can be difficult to address the ‘Check Engine’ light in a timely manner– still, if your light is on you should contact or visit Park Muffler today! We offer convenient appointments and speedy turnaround thanks to our years of customer service and technical experience.